In your regular life, you are meeting several people, but have you ever try to see your Heart & mind of your body. We are leaving like an animal life & we are spending our valuable years of life in fears & in possels we are finishing our life. God has not given the life to spoil it in eating & wondering here & there without aim. In Holy Divine & sky there are many valuable spiritual things are lying there. Our Holy God father has not given our life to spoil it. One should look toward the Holy sky (Brahmand) with its natural beauty. And as much as fast you can involve your body with natural sky, you will be enjoying it very much. They enjoy them self in natural pleasant evening & feeling are like as they have enter in new Divine world. Like this natural atmosphere if a person will not take chance, then one will feel himself that, what I had thought is not true. But if you are intend to get many things you should prepare to lost something. So it is require to be concentrating our body in a big & unlimited open sky that is Holy Devine. In meditation there are many subjects to centralize in our mind & by which our Divine root is open them, a person gets free from physical, mental & many tension. He comes out from negative thinking & change the life from tension a person free from long thinking & go for positive attitude. So meditation first step is to be concentration with being long waiting. By changing atmosphere of earth, earth gives vibration & animals, human life, trees, live or dead things are also affected on vibrations earth quake. The same way Machineries, trains Motorcar & shouting instruments of Music, gives vibra¬tions & the same vibrations change human life, gives headache. Opposite of the same above, good rithomatic music gives chearness & happiness of idealness. Those who are negative minded are effected immediately. The illness obtain by tension is changed relief of the same. spiritual bodies. The physical body is a series of separate, yet related systems of energy. 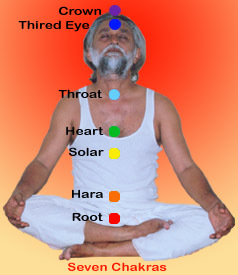 This system is referred to in the ancient texts as the Chakras. A Chakra is the interface point between the physical and non-physical form. They lie along the spine from the Crown Chakra, located at the top of the cranium, to the Root Chakra, located at the base of the spine. There are 7 Chakras with colors representing the 7 Rays. Activation and balance of energy flow in Chakras allow the body system to be at optimal with the higher self. Each Chakra acts a transformer within the body. The purpose is to bring into the system a higher frequency of vibration, from the subtle portions of the Matrix Grid, into the thicker frequencies for purification and healing of negative energies. There are seven endocrine glands, each with a vibration and color, and one is assigned to each of the seven primary Chakras. By changing atmosphere of earth, earth gives vibration & animals, human life, trees, live or dead things are also affected on vibrations earth quake. The same way Machineries, trains Motorcar & shouting instruments of Music, gives vibrations & the same vibrations change human life, gives headache. illness obtain by tension is changed relief of the same. Vibration is our life power which is called Aura. Which is made by very small atomic power, & it is produced life system. Emotions of Aura gives strong productive & vitality. Emotions of Aura gives strong productive & vitality. If the person loss it. Than any disease come to body. There is only way is left is Reiki, Meditation, Omkar Meditation, Pranayama, Yoga, only positive thinking. By applying above natural therapies the person will not go for Negative thinking. Energy consumption will be less & body will be more powerful & the person becomes strongest & keeps Aura mare continued & will be more & stronger. Body resistant power becomes much stronger. For that save energy & save Aura. To keep, maintain Aura & energy meditation is early way, best way. By doing meditation vibration body becomes more & more strong. And by putting vibrations on body, Chakra is become more & more strong. And by putting vibrations on body, Chakra are become active by that negative attitude becomes positive means illness removing. By which persons are living in cheerful & enjoyable life & longer life.